NEWINGTON - Newington head softball coach Steve Markie looked at the box score of his team’s loss to New Britain on Thursday and saw a painfully familiar trend. The Indians and starting pitcher Dani Pantano allowed four runs to the Hurricanes, but three were unearned, a result of two errors and two passed balls that proved to be the difference in the game. 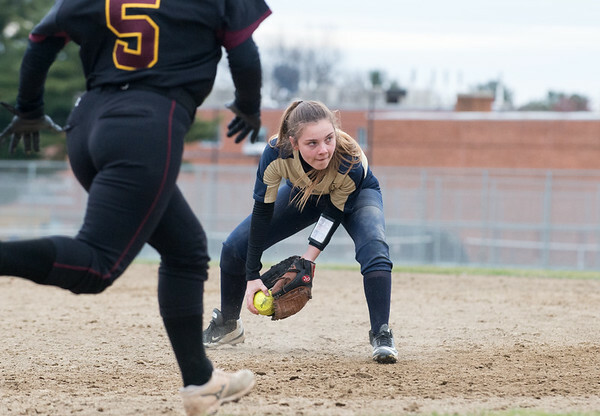 Over the past two games, Newington has allowed a total of 10 runs, eight went unearned. The Indians escaped their defensive miscues on Wednesday against Middletown thanks to some heroics at the plate by Pantano and a wild pitch, but playing against a sound defensive team like New Britain on Thursday, the defensive woes were front and center. “Once we can get our defense up to as well as we’ve been hitting and pitching, that would kick our season off to a really good start,” Pantano said. To the Indians’ credit, they have managed to mask their fielding struggles for the most part, holding a 3-2 record over their first five games thanks to that clutch hitting and the pitching of Pantano, but that can only hold up for so long. High school coaches throughout the area stress the importance of fundamental defense and minimizing mistakes, and as the season wears on and competition heats up, there will be a smaller margin for error, especially for Markie’s established captains, who are being asked to do more and help mask some of the current defensive deficiencies that arise in a young and inexperienced group. For a team that has been struggling in the field for early on, Thursday’s loss didn’t do any favors for Newington’s confidence, as an error and a passed ball led to two runs for the Hurricanes in the first two innings. “I guess it’s somewhat deflating to get behind early in games and have to dig out of that hole,” Markie said. The Indians have been doing plenty of defensive work in practice and before games, but the season’s troubles still may linger in the back of their minds, including Pantano, who tries to navigate through rough defensive stretches from within the circle. A shaky defense may make things more trying for the junior, but she’s not making any excuses. Nor is anyone on the Indians. They just know they need to be better. Posted in New Britain Herald, Newington on Friday, 12 April 2019 20:26. Updated: Friday, 12 April 2019 20:29.